For people with a cancer diagnosis, this spirit of survival, combined with the strength and support of a community of family and friends, is critical. And above all, patients need ready access to the advanced medical treatments that give them the best opportunity to win the fight. 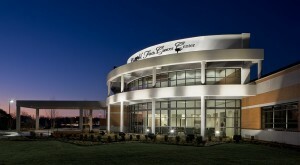 In true Southwest Oklahoma spirit, three community hospitals in three unique communities joined hands to make life better for those who face cancer treatment. Together, Comanche County Memorial Hospital in Lawton, Duncan Regional in Duncan and Jackson County Memorial in Altus combined their resources and expertise to create a new tradition in healthcare – Cancer Centers of Southwest Oklahoma. With cancer treatment centers in each community, patients can receive the care they need, close to home. In June 2017, Cancer Centers opened its newest location in Chickasha. Our network of Cancer Centers features advanced technology treating cancers with greater accuracy and with minimal damage to surrounding tissue. Every patient receives an individualized treatment plan, coordinated by an entire team of medical and radiation oncologists, certified technicians and therapists. If a patient receives initial care outside the area, they can take comfort in knowing they have the option of receiving their oncologist’s prescribed treatment with the personal care and support they need – without having to travel far from home. Nadim Nimeh, MD, Manal Robin-Hanna, MD, Michael Kerley, MD, Than Than Aye, MD, Eugenio Najera, MD, Aman Garsa, MD, Narender Gorukanti, MD, and LeAnn Smith, MD all put their expertise in the specialty of oncology and radiology to work for you. Together, these doctors have dedicated over 60 years of knowledge and experience treating thousands of patients, right here in Lawton. Please contact the Cancer Center for hope and healing, right here at home. 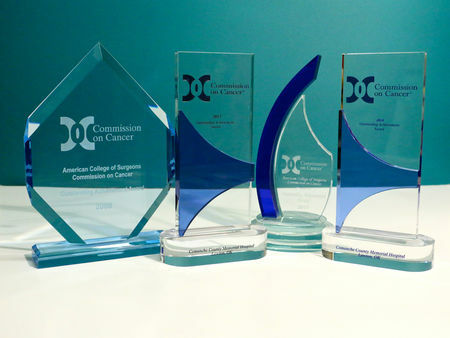 We are proud recipients of the awards shown below.